When does it really start? Is it a year round endeavor that one needs to keep on a slow simmer, then turn it up to boil as the sun starts to dip in the sky? Do you have your ducks so neatly in a row that holiday magic flows like sweet caramel sauce with seemingly little effort? For us, it’s starting now for next year. We are in it and beyond it and always trying to hold on to the magical, mystical fizz that goes on at this time of year. We are so fortunate here at Snug Harbor Farm to be surrounded by the natural goodness of the season in the town of Kennebunk. Our chores shift with a natural rhythm dictated by the plants, animals, seasons and the weather. Kennebunk and Kennebunkport established the Prelude celebration in 1981. The planners wanted to kick start the holiday season by celebrating the charm of our little seaside villages in winter. It worked. It took off to national acclaim and grows bigger every year. Now, thirty six years later, it has become one of the most HOLIDAY of all holiday spots in the country during the first week in December. 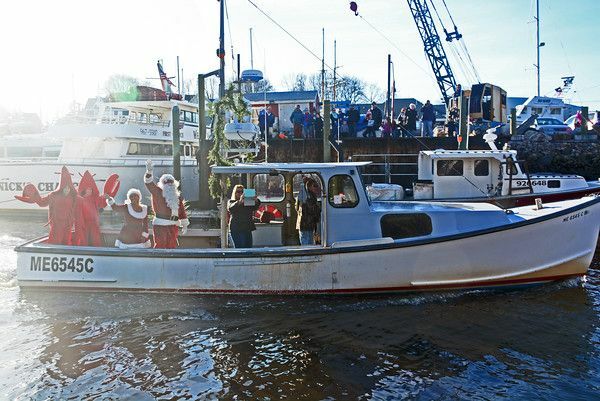 Santa arrives in a lobster boat and both towns are decked out with activities planned by local shop owners and organizations. For our part, we relish the homecoming of so many families that we celebrate and decorate from Thanksgiving through The New Year (and beyond for so many happy occasions). We develop a visual vocabulary with friends and family. We help them utilize treasures passed down and those that might be new to their collections. Our buying reflects love of the land and the comforts of home. Every one enjoys a good laugh, especially when stress sets in so look to the shop for ornaments that have a personality. There’s always room for another narwhal or yeti on the tree! We acknowledge those who have gone before us and those who may not be so lucky with friends, family and shelter. It is a time to open our hearts to the harsh reality of what others may face at a time when so many are in party mode. It can be the most isolating time for some of our neighbors. Remember them. Acknowledge them and try to bring a little beauty and light into their lives. A small gesture can literally be a lifesaver. Channel Clarence. Couldn’t we all approach our day with more kindness in our hearts? As we barrel headlong into Prelude present, we pay hommage to Preludes past and plan for the Preludes of the future with lessons of the season marking time and showing us the many wonders that happen in the cold still of winter in Maine. It’s just the beginning. We need to hold onto this magic for the next four months when the light of Spring cracks the horizon of Summer.